Welcome to Reality's End. This site is devoted to the many things that are my interests (screw whatever you like), the games I make from time to time, and some community writing efforts. Most things here are phantasy and scifi, so if that isn't your cup of tea, then you are at the wrong place, friend. Neapuzzletan Group Pic: Did you know I was working on a new game? Well, I am. I guess this is the first info on it, which ain't much of a teaser since an actual release of this thing is being expected (but isn't it always?). Wow, was it a year ago when Bimblesnaff splintered Key of Ages? For those of you unfamiliar with my attempt to create a canon Battling Dragons story, it suffered the same problems a lot of larger, older stories do. For those of you unfamiliar with writing splinters, it means the same story that has been written since March '06 has essentially become an entirely different tale, sharing only the very beginning with its predecessor. Anyone interested in writing should check it out. Not like you can mess it up any more than the original, and hey, if you do, there can always be a third splinter. This was originally scheduled to be the summer-smash hit until the ubiquitous stuff happened. Oh, that wacky anniversary RE curse~! This is still comin' out, tho', even if a li'l delayed. After all, if it is one thing that RE does time and time again, it's make games that'll ultimately be ignored~! Well, the good news is that Minecraft wasn't the most recent update I made here as I had feared. The bad news is that the last time I updated was a year ago. Yeeeee. And I just noticed that the last Minecraft update was made on 5/7, and today is 7/5! Coincidence? In fact, I've made changes that I haven't even announced in updates, like Horse Zombification. 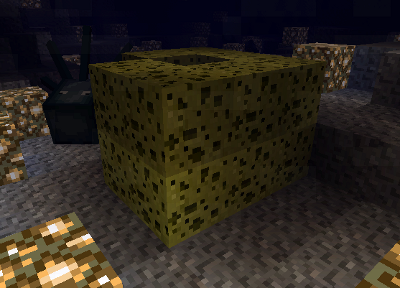 I also had to drop some of the changes I made, like those poor Barrel Sponges. I should probably put up a proper page and ChangeLog for the server. Oh well, announcement that it is not dead yet (nor I~!) is all we get. I may have gone a year without an update, but I'll be skippy if I go a full calendar year without one. Well, an update I actually announced, at least. I have still been doing Minecraft mods. With the year coming to a close, I'm reminded of the thing that has haunted me this past year -- and some of the previous, too, if the bills I've found for my various boards are any indication. It looks like the octopus got a friend; he's no longer the only animal in the ocean. 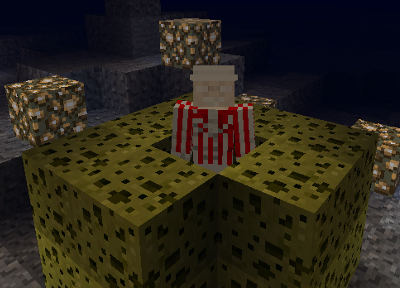 No, I didn't build that; I had to scour the ocean floor to find one that was generated naturally. This is based on the really-real Caribbean Barrel Sponge, which is so large that a person can fit inside of it. It sure seems like my yearly site anniversary curse is being accompanied by a horrible, younger sibling a month earlier. I somehow lost all of the Reality's End git tree -- including almost a year of unpushed changes. You may have noticed that my server was either saddled with an old version (1.6.x) or was a head-of-line version without my fun changes. This is because the Mod Coder Pack had fallen woefully behind, and I had been using MCP to do my decompiling. I've managed to forward port all of my changes without MCP, and so (since this was supposed to be the point of this log section) here is how I done'd it, you Googlers you.